Advantages: Realistic artwork, interesting text, “scale plans”, convenient layout. 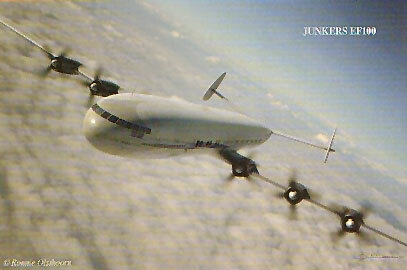 There were countless designs proposed for the Luftwaffe during World War II, and many more leading up to the conflict. Some made it to fruition but most failed to materialize. The author examines the reasons for some of these failures in Mushroom Model Publications latest release. 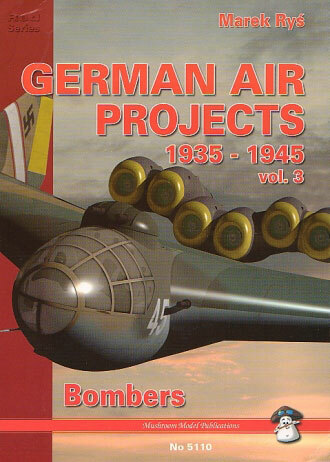 This volume, devoted to bomber designs, is the third in the series of “German Air Projects”. The book encompasses these “what might have been” developments and presents them to the reader in a handy well laid out reference source. There are 89 pages of text and a further eight that contains the artwork. The latter shows how these aircraft may have looked… had they become operational. All of the images are expertly rendered and the illustrator goes to great lengths to ensure a very realistic appearance for his subjects. The projects are arranged in alphabetical order according to those companies that conceived them. Each contains some very interesting text which explains how the type came about, its proposed development, and the ultimate fate of the subject. Specifications and estimated performance figures are not forgotten with the former coming in a handy table. These may differ from some references containing technical data; however the author makes it clear that all the information came from original German sources. He also notes that even these “official” sources contained variations. “Scale” plans are also a feature of this publication and these are competently done by Marek Ryś. Much information has recently come to light regarding Germany’s wartime ventures. These “paper projects” continue to intrigue the public due their ingenuity and boldness with design. This book captures the imagination of the subject matter and relays it in a readable, easily digestible format. Recommended to all “Luftwaffe ‘46” fans.